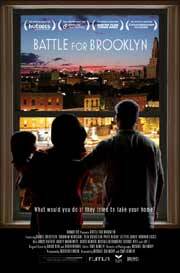 Battle for Brooklyn, the new documentary by Michael Galinsky and Suki Hawley, is opening today, June 17, in two theaters in New York City. It is screening both at the Cinema Village in Manhattan and at indieScreen in Brooklyn. It’s running for one week at both theaters and the filmmakers are hoping to attend as many screenings as possible. The film chronicles the intense fight over the controversial Atlantic Yards project being built in downtown Brooklyn. Multi-million dollar development company Forest City Ratner and local politicians propose a new basketball stadium and 16 surrounding skyscrapers to be built, but in order to do so they must kick out almost a thousand local residents and business owners, several of whom do not plan to leave without a fight. Opening at the height of Hollywood’s summer blockbuster season, Battle for Brooklyn is an equally epic, cinematic tour de force and this year’s must-see political thriller. It features themes found in its bigger budget counterparts, namely how an everyman, Daniel Goldstein, fights against powerful forces to save his home. Seven years is a long time to spend on one project, but Hawley and Galinsky being involved since the beginning of the controversy gives their film a truly epic scope. Had they gotten involved later, Battle for Brooklyn may well have been a dry recitation of facts. However, they film they do have puts us right in the middle of action as it’s happening. Daniel is not just a talking head. He is a human being whom we become connected with, just how the filmmakers made us feel connected to J.H. Hatfield in Horns and Halos. Now see the film: Cinema Village and indieScreen.